So not to be alarmist and apart from its metabolic effects, I just want to show you what prolonged sitting does in particular to your muscles. Basically if you're sitting for six or eight hours, that means you're holding your body in the same position for the duration. And you know that muscles or muscle groups tend to work in pairs, one muscle contracts and the other muscle stretches to move a body part into position, and to hold that position, that one muscle stays contracted and that other muscle stays stretched. So far, so good, until it's eight hours later. A muscle that's been contracted for a long time gets tight, and a muscle that's been stretched for a long time gets weak—particularly if they do it all over again, day in and day out. 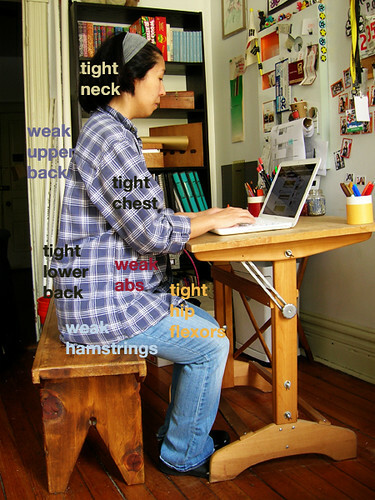 You may think of sitting as the opposite of active and you may not think of your muscles as being active when you sit, but in fact your hip is flexed, see how your thigh is at a ninetyish-degree angle to your trunk; that means the muscles that flex your hip—which are fancily referred to as your hip flexors—are contracted and the muscles that extend your hip—your hamstrings—are stretched, resulting in tight hip flexors and weak hamstrings if prolonged. Next see how your abs are on the inside of that right angle and your lower back is on the outside of that angle, so there's slack in your abs and tension in your lower back. So weak abs, tight lower back. Then you're usually focused forward on whatever's on your desk, so you lean—or worse, slouch—forward, which tends to contract your chest and stretch your upper back. And also your head hangs forward, so there's tension in the neck muscles holding up the weight of your big old head. Tight chest, weak upper back, tight neck. By the way I say "tight" for an overcontracted muscle, "strong" for a properly contracted muscle, "weak" for an overstretched muscle, and "relaxed" for a properly stretched muscle. And I talk about tight muscles needing to be relaxed or stretched, and weak muscles needing to be strengthened, and that's what we're going to do with these muscles. I said this before, but it's worth saying again: regardless of what workouts you do throughout the week, you should take breaks from sitting throughout the day. I do mean regardless; if you work out five days a week, you should take breaks from sitting throughout the day. If you don't work out, you should take breaks from sitting throughout the day. You should take breaks from sitting throughout the day. And by the way if you sit on a stability ball, that helps you take up the slack in your abs and you should still take breaks from sitting throughout the day. And also by the way if you stand at a standing desk, then you should take breaks from standing throughout the day. There's no solution where you hold your body in the same position for hours and days on end, moving is what does your body good! Breaks and workouts TK.